Do you want to work with Oracle 18c in the Oracle Cloud but the database version is not selectable in the webinterface? 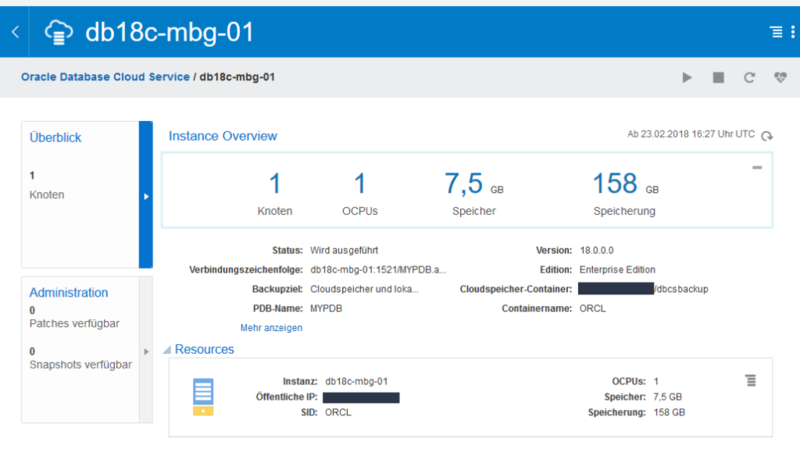 You can create an 18c instance in the command-line interface with the PaaS Service Manager (psm). The installation is very well described here, for example you need Python and OpenSSL. My personal installation of the psm executable runs in the Windows 10 integrated Ubuntu system. The file db18c-ee.json contains all the information you need to create an 18c instance. Here is my example – I have created a cloud storage container called dbcsbackup in advance because I want to use the OCI backup service. Some minutes later you can login by terminal and user SQL*Plus. Oracle 18c: Here we are! And in the OCI dashboard it looks fine too. Addtional Info: If you want a Standard Edition, just replace the line “edition”: “SE”, happy 18c. Angefangen hat alles mit einem WLAN-fähigen Storenschalter, und als später noch mit Amazon Echo Dot Alexa den Weg in mein Büro zuhause fand war die Sache klar: Ich will meine Storen im Büro mit Alexa steuern können. In der Schweiz sind Storen übrigens nichts anderes als Rolladen. Was mit der Suche nach neuen Smart Home Komponenten begonnen hat, endete im Programmieren von Alexa Skills. In diesem Blogeintrag will ich aufzeigen was eingesetzt werden kann, um Smart Home Geräte welche eine REST API Schnittstelle besitzen via Alexa Sprachkommando steuern zu können. Bei meinem Projekt habe ich nicht unmittelbar mit dem Programmieren vom Alexa Skill begonnen, sondern ich habe am Ende beim Storenschalter begonnen und mich nach vorne vorgearbeitet. Spassfaktor: hoch, Lernkurve: steil. Auf der Suche nach neuen Komponenten für Heimautomation bin ich auf das Produkt zeptrionAIR der Schweizer Firma Feller gestossen. 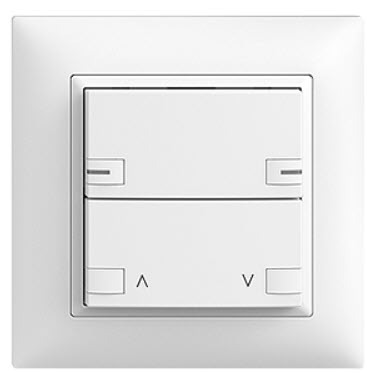 zeptrionAIR ist die Produktbezeichnung für wireless-fähige Schalter für die Steuerung von Licht und Storen. Mir gefällt an diesem Produkt, das die Produkte zwar mit einer App steuerbar sind, aber von Haus aus keinerlei Verbindung in irgendeine Cloud haben. Zudem können die Geräte via REST API angesteuert werden. Zuhause habe ich bereits Feller-Schalter und Steckdosen installiert, die WLAN-Module passen in die bestehenden Dosen. Die Module benötigen einen einen Pol- und einen Neutralleiter und werden hinter der Schalterabdeckung platziert. Die Schalterabdeckungen können mit beliebigen Funktionen und Szenarien bestückt werden. Die Einrichtung via App und die Anbindung ans WLAN ging problemlos, die von Feller mitgelieferte Anleitung ist gut aufgebaut und leicht verständlich. Via Online-Formular kann beim Feller Kundendienst die API-Dokumentation kostenlos bestellt werden. Darin werden alle Möglichkeiten aufgezeigt, mit REST Kommandi die Komponenten zu steuern. Das Kommando beinhaltet nebst der IP-Adresse der zeptrionAIR Komponente den Kanal / Schalter welchen man ansteuern will und welche Funktion ausgeführt werden soll (cmd=close). Soweit die Ausgangslage. In einem zweiten Teil werde ich euch die Installation und Konfiguration von Node-Red und das Zusammenspiel mit Amazon AWS IoT erläutern. 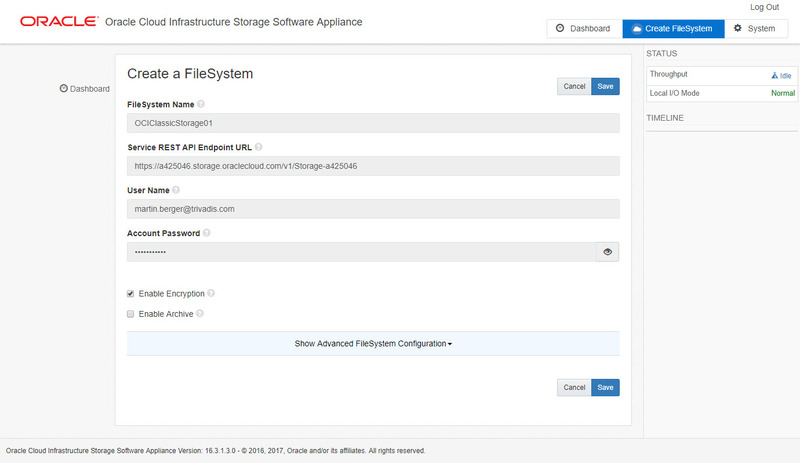 The Oracle Cloud Infrastructure Storage Software Appliance – also known as Oracle Storage Cloud Software Appliance OSCSA – acts as a gateway between classic storage and the Oracle Cloud Infrastructure Object Storage Service. 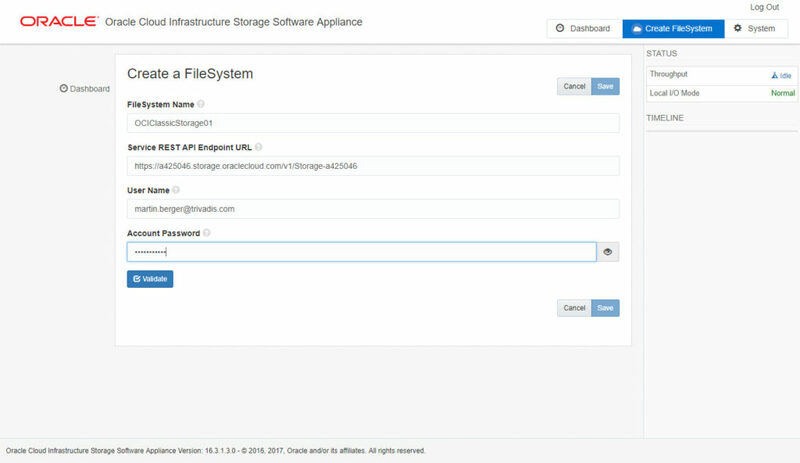 The appliance can be installed on an on-premises Linux system or in an Oracle Compute Cloud machine and runs in a Docker container. It offers a local cache where clients can place their files before the OSCSA moves them into the Storage Service. The communication between a client with a filesystem to the OSCSA works with NFSv4, from the OSCSA to the Object Storage Service, Oracle is using their REST interface. Traffic from the OSCSA to and from the Oracle cloud can be encrypted and compressed. In this blog post first I will show you how you can install and configure the OSCSA in an on-premises environment. In a second step I configure an on-premises database server which uses the Object Storage Service as Oracle RMAN backup location. The installation and configuration of the required Oracle Linux components OL7 with UEK4, Docker and NFS is very well described in the “Using Oracle…” guide. Please take a look in the guide, it’s straight forward. The OSCSA installer does not start when the requirements are not fullfilled. All installation steps are executed as OS user root. The Oracle Storage Cloud Software Appliance Software Release 16.3.1.3 is available on my local machine in folder /stage. The extracted OSCSA file contains a file called OSCSA_GATEWAY_README.txt where you can get more information about the installation and configuration possibilities like proxy etc. The installation starts by executing oscsa-install.sh. I have added the parameter -a = advanced so I am able to set ports for NFS, Administrative Web Interface and REST. Oracle recommends for the cache storage a minimal size. I have ignored that for my test environment. TOTAL RECOMMENDED MINIMUM SPACE FOR VOLUME /oscsa/data: 300 GiB. PROVISION A VOLUME DEDICATED TO OSCSA WITH ADDITIONAL DISK SPACE. TO PROCEED, TYPE "CONFIRM" OR PRESS ENTER TO STOP THE INSTALL. TOTAL RECOMMENDED MINIMUM SPACE FOR VOLUME /oscsa/metadata: 380 GiB. TOTAL RECOMMENDED MINIMUM SPACE FOR VOLUME /oscsa/log: 400 GiB. Invalid input please type CONFIRM to proceed or press ENTER to stop the install. Enter the docker network mode (host or bridge), Hit <Enter> for the default bridge mode. 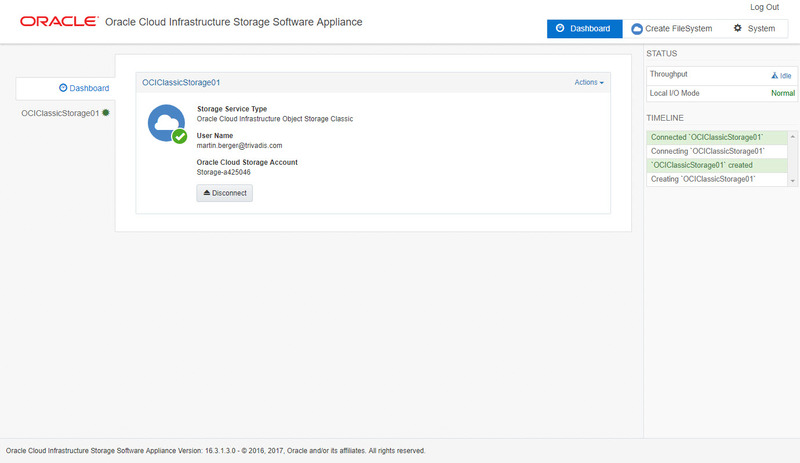 Now the Oracle Storage Cloud Software Appliance can be started. A server reboot is not problem. The docker image will be started after server startup automatically. TOTAL RECOMMENDED MINIMUM SPACE FOR VOLUME /dev/mapper/ol-root: 200 GiB. you can access the NFS share using the following port. In this step, the OSCSA will be connected to the Oracle Cloud. At the moment, no <OSCSA FileSystem name> is configured. An OSCSA filesystem is like a namespace containing a set of data. 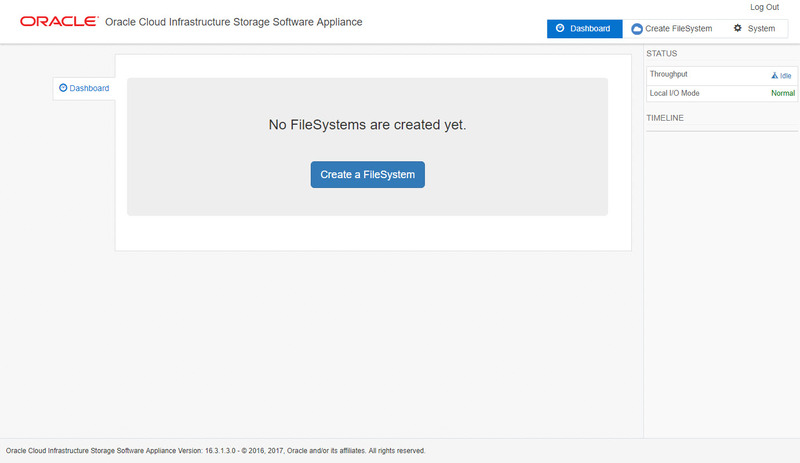 Now we can log in into the Appliance Web Interface to create our first Object Storage filesystem. URL for the interface is https://<servername>:<port>. The port for the interface was set during the installation process. For the connection to the cloud, you need to know your Identity Domain, Username, Password and REST Storage Endpoint URL. The FileSystem name will be reused later for the NFS mount. Enter Domain, Username, Password and REST Storage Endpoint URL. Below this screenshot you can see where you find the URL in your Traditional Cloud Account. Here you can see the REST URL. If the account informations are verified, you are able to enable compression and encryption. I have enable encryption here. Click Save. The OSCSA storage is now ready to synchronize with the cloud. Click Connect. Now you can see the the connection between the Oracle Storage Cloud Software Appliance and the Oracle Cloud Infrastructure Object Storage Service is ready. 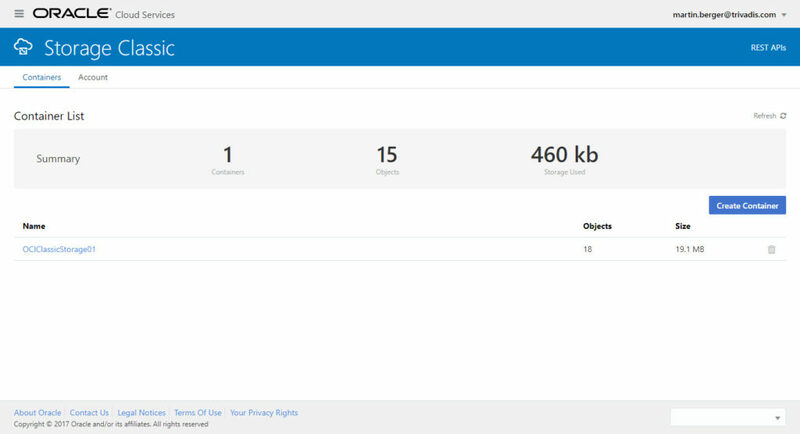 In the Traditonal Cloud Account in the Storage Classic dashboard is a new object storage filesystem available. Let’s connect the database server to the OSCSA to store data in the Object Storage Service. First we check again on the OSCSA server if the service is running. # oscsa info Management Console: https://breitenbach.martinberger.local:32771 If you have already configured an OSCSA FileSystem via the Management Console, you can access the NFS share using the following port. On the database server a new mountpoint will be created. We mount the OSCSA with NFS v4 to the local server. This entry can be added later to autofs or whatever you use to automatically mount an NFS filesystem. Permission of the mountpoint is drwxrwxrwx – so everybody can write into it at the moment. A new subdirectory on the NFS mountpoint will be created. Start Oracle Recovery Manager RMAN database backup. The backup files are created locally in the specified mountpoint directory. drwxr-xr-x. 2 oracle oinstall 0 Nov 8 15:06 .
drwxr-xr-x. 2 oracle oinstall 0 Nov 8 09:46 ..
At the moment where the backup sets are arrived on the mountpoint, the OSCSA begins to encrypt (this was my selections during filesystem creation) and transfer them into the Oracle Cloud. This is visible in the Appliance Web Interface. 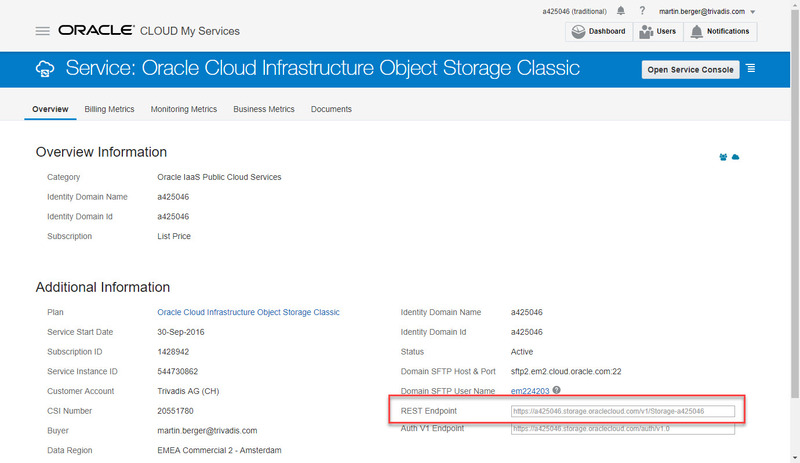 Now the files are uploaded into the Oracle Cloud. This can be verified in the Traditional Cloud Account in the specific filesystem. The files are encrypted and have file names like 10101-v1, 10103-v1 etc. 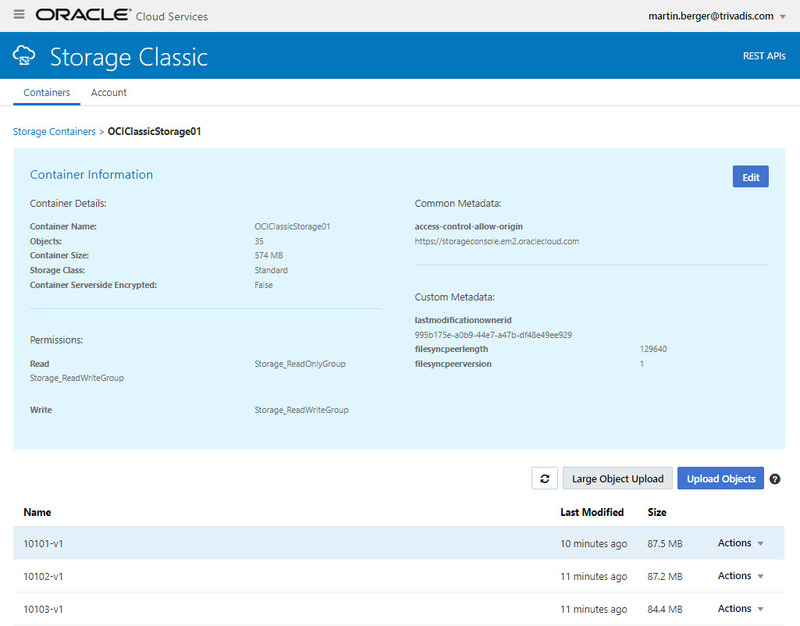 Sure, this was just a basic overview how to configure the on-premises Oracle Storage Cloud Software Appliance. There are many more features like retrieve data, cloud access via command line, preserve filesystem cache, create directory permissions, set user permissons, monitor the appliance, backup the appliance, encryption key handling, use the archive storage and so on which are worth to spend more time for investigation in the future. The Oracle Storage Cloud Software Appliance is a nice piece of software which helps you to use the Oracle Cloud Infrastructure Object Storage Service. The appliance is easy to install and configure, local encryption is possible and the documentation is very good. Database Backups and Database Export a perfect candidates for this service. The price is hot, $0.0204 per GB for the first TB, and $0.0201 per GB for the next 49TB.